Royal Unibrew must be a safe and healthy place to work for its employees; the Group focuses on preventive measures to avoid employees being worn out and incurring work-related injuries and works actively to promote job satisfaction. In most production sites and representing more than 75% of produced volume near-accidents are registered and followed up daily with a view to establishing preventive measures as quickly as possible in order to avoid accidents. At all production sites, health & safety activities are carried out adapted to the local production site and work area. In Denmark, for example, joint health & safety discussions, a health & safety day as well as courses with focus on tools to reduce daily peak loads were organized in 2018. Also, in 2018, follow-up was performed on the findings of a job satisfaction measurement made in the period from December 2016 to February 2017 among all employees, and measures have been taken locally to identify factors that may contribute towards higher job satisfaction. Based on the job satisfaction measurement and the reporting on near-accidents in 2018, investments have been made in technical aids and measures to prevent e.g. heavy lifting and harmful movements. Financial resources are specifically allocated for this, as an example for ladders, platforms and protective equipment. The key risks especially relate to working accidents or employees being worn out due to physically demanding jobs and job dissatisfaction. Having set a target on the maximum number of working accidents per million working hours as well as on the minimum number of near-accidents reported per year and thereby focusing on eliminating risk areas before they turn into accidents has proven a successful strategy for reducing number of working accidents. These targets are set by the individual sites to reflect their individual safety awareness. A job satisfaction survey is regularly carried out among all employees. The survey results in an overall job satisfaction score and provides us with the possibility of monitoring developments in the area. 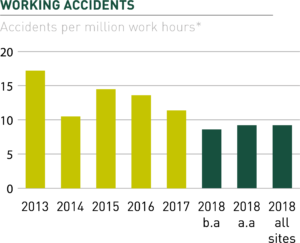 It is highly satisfactory to note that working accidents are at its lowest ever frequency which is attributed to the focused activities in eliminating risk factors in production prior to them developing into accidents. The positive development has mainly taken place in our Danish and Baltic production sites and as illustrated, the safety culture of our 2018 acquisitions needs to be addressed. Focus in coming years will be on gaining most possible insights from our near-accidents by using root causes analysis to decrease the number of accidents and especially to enforce same focus at our acquired businesses in France and Italy. Reported numbers do not include accidents in the sales organization, as these are not registered structurally like in the producttion area. This will be changed during 2019.